If you are diving enthusiasts and want to vacation in Malaysia, Pulau Payar Marine Park is a tourist attractions that is right to visit. This location is the best place to enjoy the underwater scenery in Malaysia. 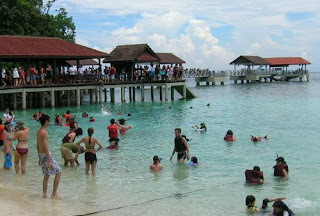 Payar Island Marine Park is located in the northern Strait of Malacca, precisely located in Kuala Kedah off the beach. Payar Island Marine Park actually includes four islands at once, namely Pulau Payar, bushel Island, Calf Island, and Island Glass. This location is the first marine park in Malaysia and is a nature reserve under the sea. The water was crystal clear sea is suitable for a variety of water activities, like swimming, snorkeling, and diving. Some resorts are already providing facilities to explore the underwater beauty. About the scene, no doubt. Here, you can get all you want while diving. On the beach southwest Kuala Kedah, you can find under the water park is very beautiful, commonly known as the Coral Garden. This park has a collection of diverse coral species are very beautiful. Its colors are very clearly visible. Let alone when diving, marine park on the surface it looks beautiful already. Coral reefs are also home to small fish are funny. If lucky, you can meet with other marine animals, such as shellfish, octopus, sea horses, starfish, reef fish, and much more. 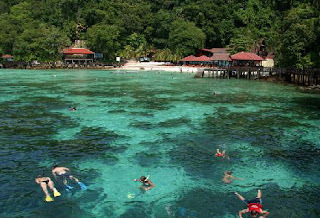 Payar island is equipped with various facilities for a vacation. Access to the island is also quite easy. From Kuala Kedah beach, you can cross the ocean with a boat motor. To get to Pulau Payar, boats will depart daily at 9:45 and return to Kuala Kedah Coast at 15:00 local time. This marine park can be visited throughout the year. However, if you want to see the underwater sights of the most perfect, you can come between February and November.